Surprise surprise! 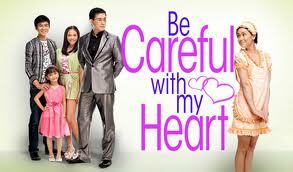 Yes, I am a fan of ABS-CBN's series 'Be Careful with my Heart'. This is the first Pinoy TV series that I have watched in almost 4 years. During the first few runs of the show, I saw several comments and praises regarding this morning program. I am not really into Philippine television shows. Since I started working abroad, I started to love US series on which I am really addicted to and I even did a 24-hour marathon for a show. Yes, 'Walang Hanggan' was also a hit based on Facebook and Twitter trends but I am so fed up with heavy drama and some kind of impossible scenarios (like a person rose from death to life; a criminal who wasn't arrested despite the obvious evidence and the list goes on). It's like I am filled with much suspense, cyring scenes and roller coaster of events in US series alone. Because of those posts on my FB timeline, my curiosity in this show heightened. How can a soap in a morning timeslot be this successful? So I subscribed to TFC.tv (1,500 PHP for 3 months) and began my journey with Maya & Sir Chief. So there, I compiled a list of items on why I think the show is so successful. The plot and storyline is so simple and "napakagaan". I think this theme is so applicable if you will start your day by watching the show. It's a great way to spend with your morning routines as it could give you positive vibes that can be used for the entire day. The family values and lessons that we can get from the show are big factors. Those scenes are really happening in real life. Everyone can connect to every character. We might be experiencing the same thing with a role that is being portrayed. The "kapit-bisig" theme expresses how Filipinos truly are: being strong in the midst of crisis and adversities and putting up a smile on every problem. I'm sure that most of us are looking forward to the love story of the main characters. How can they make us "kilig" even if there are no kissing scenes and love scenes? Even if Maya is not really working abroad, I can relate to those scenes on which she really misses her family. Every OFW is experiencing the same thing on which it is also a reminder that family is the true source of strength. The "loveteam" of Kute and Papa Pards is very different from what we were used to. I think the Filipino audience is becoming matured now and more understanding given the fact that Kute's sexual preference is different and it did not became a hindrance in establishing a good family. I believe that other networks are trying (or have tried already?) to compete with the show but I think 'Be Careful with my Heart' will continue to touch our heart in every way and will be on air for many months (or even years?). They have already established a standard in morning programming and because of that, they deserve a bonus from their network, haha.